Mxhost Review 2019: Is Mxhost a Good Hosting? Romanian company MXHost offers accessible yet customizable premium web hosting packages for businesses of all sizes. Their varied portfolio includes websites for news agencies, software developers, travel agencies, online publications, and e-commerce businesses. onClick="trackClickout('event', 'clickout', 'Vendor Page - Visit User Reviews', 'Mxhost', this, true);"
I have the host and the domain from them for more than a year, and I have had no problem, very satisfied with the services offered, and the support is the best.. It was a pleasure to work with the support team from MXHost. They are very kind and willing to help even if the issues don't concern the actual webhosting services. They helped me move from a different provider, and assisted with every step until my website was online again. The servers are with SSD storage, so that is a huge plus! I am very satisfied of their technical support. The guys are really nice and helpful! I recommend them. Founded in 2004, MXHost began with the simple idea of designing accessible yet customizable premium web hosting packages to cater to businesses of all sizes. This idea paid off: their varied portfolio now includes websites for news agencies, software developers, travel agencies, online publications, and e-commerce businesses. MXHost serves a customer base of over 27,000, including 570 reseller hosting companies. The Romanian web hosting company only serves customers in their native language of Romanian. MXHost offers SSD shared hosting, VPS, WordPress-optimized hosting, reseller packages, and dedicated servers. Their premium SSD shared hosting packages are especially popular with their clientele, since these aren’t your run-of-the-mill servers: they feature several performance-accelerating technologies, such as the LiteSpeed Web Server, CloudLinux for resource and account isolation, and a dedicated IP address (for Business SSD packages or better). All shared hosting accounts are guaranteed to have 99.9% uptime and come with a free website migration service. One thing I didn’t like about them, however: only their two highest-tier shared hosting packages include SSL certificates for your domains. Since Google announced that all websites without HTTPS and SSL protection would be marked “not secure” from mid-2018 onwards, this was rather disappointing to see – and seemed like an oversight considering their vision to craft “accessible” hosting packages. Another aspect I didn’t like about MXHost: it seems that if you register a domain name with them, it’ll be listed under their company rather than your own name. This introduces a kink in the process should you ever wish to migrate off MXHost, or perhaps simply renew your domain with a different registrar. While not an impossible task, it may be extremely challenging for beginners. Note also that other than their WordPress-optimized hosting packages that come with WordPress-specific support and tools, MXHost isn’t a particularly beginner-friendly web host. They have no one-click app installers, nor do they include a website builder with their packages. MXHost definitely isn’t the cheapest web host in the market, though if you consider the fact that their entry-level package includes multiple-domain hosting, they’re not bad. The fact that they don’t include SSL certificates in their Personal or Business SSD shared hosting packages was a letdown, since this will incur extra costs and inconvenience for beginners starting out in the web hosting world. On the bright side, the free domain name registration included was a nice perk to see with their entry-level package, though it comes with the caveat mentioned above. Sadly, MXHost doesn’t have any free trials, nor do they have a money back guarantee – so there’s no way to really try out the service before you commit to a package, all of which require a one-year commitment at minimum. That said, MXHost has established a decent track record of customer service since their inception in 2004, albeit with a few hiccups along the way. They were responsive even when I contacted them at odd hours, which is a good sign for any international customers. They generally direct you to their knowledge base by default as this will cover the most common questions, but if this doesn’t adequately address your issues, you can always open a support ticket or call them via their Romanian support hotline (the latter is only available during extended business hours from Monday through Friday). I especially liked that they also offer you the option of remote support, which allows an operator to provide in-depth, step-by-step guidance through the help of TeamViewer. MXHost is an above-average web host for intermediate users, and customers will enjoy the value-added features of their Business SSD packages or better. However, their lower-tier shared hosting packages will be limiting for businesses or individuals hoping to grow their online presence. 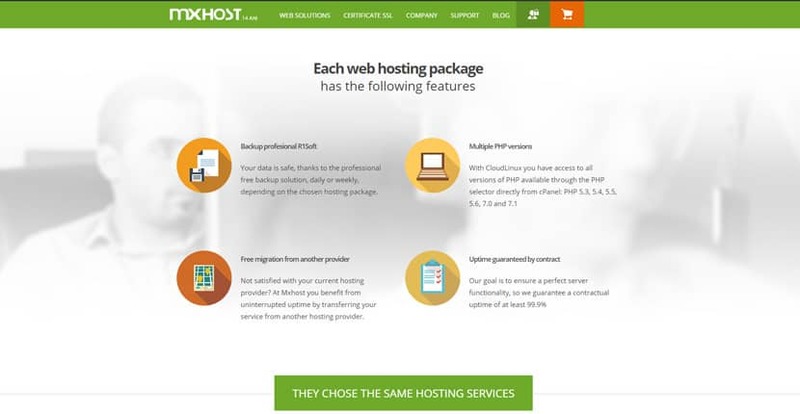 Wondering how Mxhost stacks up against other Web Hosting companies? Enter any other Web Hosting company and we will give you a side-by-side comparison.